For the last few months, Microsoft has been trying to pick a fight with a company called WebXchange, but Tuesday a San Francisco federal district court judge ruled there was nothing to fight about and dismissed the action. Microsoft was seeking a declaratory judgment that it was not liable for inducement of infringement by customers that used its Visual Studio software, which allows companies to create their own business applications. The reason: In March 2008, WebXchange had sued three companies–Allstate, Dell, and FedEx–that used Visual Studio for infringement of three patents for systems that facilitate real-time transactions on the Internet. Those three companies asked Microsoft to defend and indemnify them in the suits. Microsoft is represented by John Vandenberg of Klarquist Sparkman and Michael Bettinger of K&L Gates. Notice the inclusion there of Bill Gates’ dad and some politicians. Bill Gates’ dad was also involved in the Abramoff fiasco, so he may still be pulling a lot of strings behind the scenes (including SCO, from which he pulled money last year). We recently remarked on reports that Bill Gates’ dad leverages a lot of litigious powers and the effect is there for all to see [1, 2, 3, 4, 5]. If Bill Gates’ dad works with the former U.S. Attorney General, then it’s worth bearing in mind when a Microsoft-sympathetic antitrust chief gets appointed after publicly attacking Google. This confirms some widespread allegations that Microsoft is more than just a company and somewhat of a "cult" (to borrow the word used by a Euopean government delegate) or a "political movement". This case above was an important one also because it may have ramifications for Mono, as we explained before. In other interesting news, Google’s embrace of GNU/Linux is beginning to transcend the server and popular mobile devices. Google’s Android platform is now being embraced for some sub-notebooks, so according to reports like this one, the monopolist might stifle GNU/Linux adoption using a last resort: software patents. The problem Android creates for Microsoft is long-term. If engineers can create applications that do mirror what Window does on the PC, Redmond has a problem. But that development process could take years and could run into patent problems because of key IP rights that Microsoft has set up over the last two decades. We have already seen the company's Bill Gates scheming to use software patents against OpenOffice.org (StarOffice at the time). 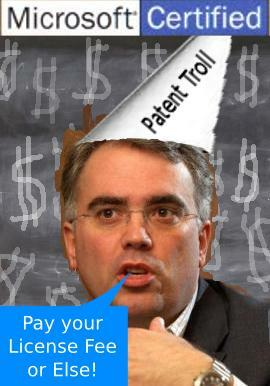 Google has another front to battle on, namely that of patent trolls. Here is a new article on the subject. Google Inc. is going on the offensive to fight patent claims, a strategy the Internet search company says will deter frivolous lawsuits. The number of patent challenges against Google rose to 14 last year, from 11 in 2007 and three in 2006. The company wants to curb that growth by fighting rather than settling lawsuits, said Catherine Lacavera, Googles senior litigation counsel. Gutierrez, who has taken an increasingly active role in Microsoft’s intellectual-property strategy since moving back from Paris a few years ago, where he had served as Microsoft’s associate general counsel for Europe, Middle East and Africa (and where I first met him for hot chocolate and coffee), is well-known to the open-source crowd for his involvement in Microsoft’s accusations in 2007 that Linux violates 235 of Microsoft’s patents. It is worth seeing how Microsoft wraps around ("schmoozes", to use its own terms) the very same people whom it threatens and abuses. The above is a confession from an open source company executive. It is also important to keep track of patent trolls which accommodate Microsoft moles. Acacia is one of the bigger examples [1, 2, 3, 4, 5, 6, 7, 8, 9, 10, 11] and it has already attacked GNU/Linux. In its latest extortion, Acacia manages to squeeze out money from Johnson & Johnson. Acacia Research Corp. announced that its Cardio Access subsidiary has entered into a license agreement with Johnson & Johnson covering a 1993 patent relating to medical devices. What is going through the minds of people whose companies produce no products? The Earnings Call Transcript from Acacia (just days old) sheds light on the thinking inside firms that are all about extortion and exploitation (misuse) of a broken system. Here is another new Acacia extortion which exploit patents on “e-commerce pricing”. After appointing several pro-intellectual monopolies people to join the cabinet [1, 2, 3], Obama’s administration shows no concrete signs of that it has a roadmap for resolving this plague of intellectual monopolies. Joe Mullin has another fantastic post, discussing how way too many reporters, in covering patent disputes, mislead the public into thinking that the patent holder is accusing another company of copying its invention. The truth is that it’s very, very rare for a patent infringement lawsuit to actually involve a company that copied (or, as the patent system supporters would falsely claim, “stole”) someone else’s invention. Usually, it’s about companies coming up with a similar offering independently. It has become increasingly clear that offices all over the world face the same broad problems in getting fee structures right, deciding what requirements should be placed on applicants and dealing with the backlog. So the best way to tackle them is to work together to find solutions. iii. Will 4G get stuck in the technology patent trap? WCMDA offered higher capacities and more features than GSM, but operators could not substitute their 2G networks for 3G networks overnight. 3G handsets continue to support the previous generation of technology. This trend will continue with LTE; there will probably never be a pure LTE handset – even data-only dongles are likely to be multimode. Next generation handsets will likely support LTE, WCDMA and GSM/GPRS, not to mention a number of other connection technologies such as Bluetooth, WiFi, WiMAX and RFiD. Each additional standards-based technology will add incremental cost to the product in terms of technical complexity, but also royalty costs. The mix of other technologies expected in modern handsets such as MP3, cameras, DVB-H, GPS and touch screens increase this complexity further. Until a solution is found and also devised, this patent system will continue to be a laughing stock. To give examples from the past few days, one company without products has patented text messages and another company has just patented underwater metal detecting. Kaspersky gets its own monopoly on software that removes viruses (i.e. a patent that can harm security) and TV guides too become the virtual ownership of one company. Security of card games is now a patent and so are universal remote controls. Unsurprisingly, some of these trivial patents lead to spurious lawsuits which produce no innovation. They do not pass any value to customers, only additional cost. Watch out for google (and for many many others.. ie, don’t give them a free pass on this issue). They want to preserve the patenting system by pretending there is a higher bar of inventiveness which is objectively quantifiable fairly and above which 20 years of government granted monopoly protection is all of a sudden the merited prize. Large companies recognize patents can help them hold their market position. Let’s look at the problems with patents today (US perspective mostly). First, prior art is a problem. The easiest of solutions will be patentable if the first to publicly present it patents it. Hence prior art means nothing except whether or not the first up with an idea (and it could be a very easy idea certainly not worth any monopoly status beyond 5 seconds) decided to file the patent application. To fix this, the system further says the invention must be innovative or says that it must not be obvious to a practitioner (or something like that.. not sure the specific wording). ..as if passing this vague test somehow implied your invention went from worth 0 seconds of monopoly protection to being worth exactly 20 years of such protection. Many things aren’t obvious on first look or to one person or within a very short amount of time. So what? How do we jump from that to 20 year *monopolies*? Who says that there aren’t 10 people out there who could, individually, come up with the idea (and a near implementation) in less than 1 year? Why should these people and the groups they represent and wish to help be kept from their creations on account of already-government-granted monopolies? Thus even if something appears very very advanced and complex, that really is not a reason to grant monopoly status. But there’s another reason the great/amazing ideas should not be protected merely because they are great. It’s that no man is an island. All people leverage lots of ideas that others had frequently decided not to trouble patenting. Had these been patented, the new inventors would not get their patent or would not be able to do much once the others decided to seek injunction (eg, in self-defense). Now, let’s consider a fairer system to help address the above issues of only some getting patents (and entire rights implied thereby) despite the existence by others of creative input used in building those inventions: everyone gets auto patents. Automatic patent monopolies? Maybe, let’s see. If people got automatic monopolies on ideas similar to what happens with copyright, then prior art wouldn’t just invalidate the new patents, but it would automatically give that prior art inventor the same powers that the person with the patent had. In other words, patents should be automatically given if they are going to be given at all. [Let's hear arguments perhaps on why patents somehow deserve no automatic granting but copyrights do.] But I hope people see that can of worms that just got opened up if we follow along this path. A major problem is that patents today are way too broad (unlike copyrights which are much less). “Independent” creation is not likely to violate copyrights but it is likely to violate patents. [I am not absolutely certain about this, but I think this is the case based on today's laws and practice]. This immediately suggests a possible solution. Perhaps a rule of thumb for giving out patents would be to compare their scope to those of copyrights and see if independent invention would be tripped up. We could insist that patents behave more like copyrights in this respect. In other words, if a person not looking at the solution comes up with something similar when given the end desired goal, then they better not violate a patent. When dealing with copyrights, we always allow new authors to try and write new prose that attempts to convey the same stories/teachings/etc as others have already done. They won’t violate copyrights if they don’t attempt to copy. Similarly, patents should not be violated under similar conditions. If we move in this direction, to mimic copyright protections, the nature of patent granting and revocation would totally change. Perhaps the USPTO would we less focused on granting (grants would be automatic) and more focused on judging/reconciliation and even on defining the monopoly length. There are unworkable issues here as well though. If we decide not to change the broadness problems, however, then I think we will find that a fair automatic patent granting law (everyone gets it automatically) would easily lead to unworkable situations because any invention relies on many sub inventions and ideas which could get written out (after-the-fact) into a very broad scope. Before or as we tackle these specifics, I would like to see created a Bill of Inventors’ Rights to apply to all humans. “Stimulation” of economy, even if partially satisfied, cannot generally trump the rights of people to create and share (even for $$). Society is hurting because of our broken patent system based on broken concepts and which violates the rights of people to free thought and speech [inventions as speech and way to express ourselves for the aid/entertainment/etc of others.. the dissemination of our own works, values, and ideas]. Worse, the harm is huge when you consider the many talented inventors that are handcuffed in many cases and the 20 years such handcuffs last. Since our current system is so broken, especially in areas like software, where passage of the new rules I hope eventually get created would likely lead to many or all software patents being revoked, I would also like a hold to be placed on enforcing certain types of patents today, eg, software patents. Such a hold would be done in the interest of people/inventors everywhere. An immediate task force should be set up to help figure out which are the categories of patents that should be put on hold the quickest. Naturally, there are exceptions (always). We want to keep in mind the cases where abridgments of free speech and inventor rights would be acceptable. Note, that high costs usually immediately imply few inventors, which implies we might want to artificially stimulate inventing. High costs also mean that investments may require extra help (beyond trade-secret status and first-to-market advantages) in order to get recouped. However, you don’t want to prop up an expensive model (horse and carriage) simply on account of costs. For example, you want any such granted patents to be revocable once more efficient mechanisms have been discovered. Open source development is a workable and more efficient mechanism than proprietary development, for example. High costs can come in research (experimentation), development, marketing, distribution, etc. Remember we don’t want to penalize cooperative approaches to this (where costs are distributed and or very low on an individual basis) to subsidize those that decide to go it alone and spend a bundle in order to acquire the coveted 20 year monopolies. Yes, there are a lot of questions that remain. The details always show that much care must be taken in writing up any new law. I hope though that it’s at least clear that the current system is broken and is doing harm. The thing is, if someone implements something original, s/he does not know this unless an exhaustive search if done to identify prior art (including that from someone who implemented it but not patented it). Do you see how this becomes cyclic? In reality, Richard Stallman said that it needs not to be obvious to a child aged 5, or something along those lines. Video here. >> if someone implements something original, s/he does not know this unless an exhaustive search if done to identify prior art (including that from someone who implemented it but not patented it). The point above (maybe you noticed and agree) is that being first isn’t that much more special than being second, third, etc. In particular, the system is obviously **very** flawed if somehow “firsts” to ideas that aren’t that special (so as to be worth 20 years of monopoly over second place) are granted the long-lasting monopolies. Yeah, but I was going further than this comment and saying that even if we over-hauled our inventiveness bar, we would still end up with a system that would generally make little sense and be unfair to humankind as well as to those that are capable of coming up with the unordinary invention. I want a Bill of Inventors’ Rights that would trump any laws. Maybe free speech already implies such freedom to be creative and share your inventions with others (except under extenuating circumstances). Another point was that many people that aren’t marked as authors (for this or any patent) contribute to the creation of the “inventions” of any patent. This unfairness is a motivation for suggesting that patents be granted automatically. Of course, auto granting doesn’t resolve the issue that second is not that much weaker than first. It also doesn’t address that many have ideas that just seemed too ordinary to be worth publishing at that point in time. What it does is to help show the stupidity of the system.. at least unless the power and/or scope of patents are narrowed tremendously. If I saw that before, I didn’t pay much attention or see all of it. I know that RMS and others have studied sw patents, organized their ideas well, and influenced other people (I did read one of his more popular essays on patents). Now to watch the remaining parts of the video. Regarding the WebXchange case, to the extent that Microsoft “sought to declare unenforceable and invalid the patents at issue” I was hoping they would prevail. Nonetheless, the judge’s ruling would seem to cast some doubt on whether large corporations such as Microsoft can provide its customers any greater degree of patent indemnification than smaller, Open Source operations. Yes, a reply that I received about this via mail was: “[T]he case was about Microsoft trying to wiggle out of indemnifying Microsoft’s own customers that bought licenses for Visual Studio software. Remember all that Microsoft FUD from Ballmer about the Linux patent liability and by implication users of the Microsoft product would be protected, by presumably Microsoft. This case is sets a huge precedence in the history of EULAs and what exactly protections it imparts to the end user of the product. I’m surprised by the total non-response to this issue in the press. Maybe I’ll do a followup post on the subject. Trolls used against foss companies suggests trolls be used against Monopolysoft. I know FOSS people who wanted to create a patent troll firm only to attack Microsoft products and get the message across. You could acquire all the right patents and just sue Microsoft with an explicit message. It’s like fighting extortion with extortion. >> It’s like fighting extortion with extortion. I’d call it self defense. The point isn’t to make a living at it, but merely to stop patents being used against FOSS. As I learn more about patents, I almost feel that I could jump on the bandwagon and begin to block areas off (ie, acquire the power to do so). Maybe the patents could be sold to someone else under contract that they would attack monopolies to get them to reconsider supporting a system that damages FOSS unfairly if perhaps legally. Like you suggested though, it’s better to abolish the system than to play it, but we do have to do something to help knock reason into those using vast resources to support the system. If *any* attack on any FOSS entity would result in attacks on FOSS competitors in proportion to the attacked FOSS company supporting FOSS and directed proportionately to those not supporting FOSS proportionately to them not supporting it, we could make the patent system expensive to all of these giants supporting it. Once they are on the side of reason, the law has a much greater chance of being made reasonable. Basically, those that don’t mind doing this will/could/should. The idea I heard about was to remove features from Microsoft Office using litigation (no settlement option or room for negotiation). Well I guess in the end the whole IT economy will grind to a halt as it will be too expensive for anyone to innovate. If I knew my history better i’m sure I could point to some similar situation from history where society was badly affected by such short-sighted nonsense and technology. The IT economy is far bigger than any such technological situation in the past though, so the effect will be much worse.